For paralegals and legal assistants, there are often more tasks to be done than time in the day. If you’re a paralegal, you know what we mean. The attorney, or attorneys, at your firm relies on you to accomplish quite a bit to support them. Not only do you have to get a lot done, but have to be incredibly efficient and have little room for error. 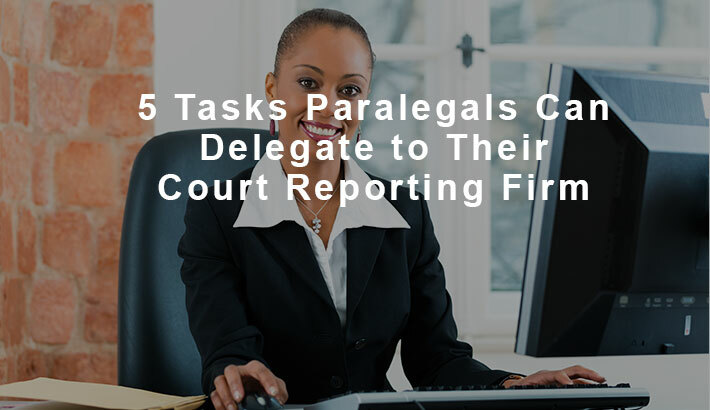 While paralegals are often the ones being delegated to, we want to let you know about some tasks you can and should consider delegating to your court reporting firm. When it comes to scheduling depositions, one of the first tasks a paralegal does is schedule a court reporter. The number of additional tasks the paralegal has after scheduling the court reporter depends on how much they’re relying on their court reporting firm. In the decades of being in business, we at Casamo & Associates have worked with many paralegals. Some truly understand how much they can delegate to a court reporting firm and some do not. Let’s discuss some of the most common tasks that you can delegate to your court reporting firm. Video Depositions – When you need a legal videographer to record your depositions, ask your court reporter or reporting firm to schedule one for you. A full service court reporting firm will often have in house or have close working relationships with videographers. They should already know which videographer(s) are well qualified for the job and will work well with the reporter. This can help you by making the schedule, billing and production and delivery of the deposition transcript and video process seamless. Videoconferencing – When travel isn’t the best option, videoconferencing is extremely useful for depositions, interviews, meetings, demonstrations, distance learning, training, focus groups, consulting, and executive conversations. Instead of trying to find a videoconferencing solution on your own, ask your reporter or reporting firm if they can provide it for you. Some firms will have state-of-the-art technology and will connect you to your long distance meeting, conference, or deposition. Your court reporter may help you schedule, organize and implement your long distance videoconference. They may even help you find another videoconferencing site close by your other participants. Some firms are affiliated with comprehensive videoconferencing networks, allowing them to easily take care of the details for you. Day-in-the-Life – If a picture paints a thousand words, imagine what a video can do for your client. A day in the life video brings your client’s story to life and personalizes the injury as words never can. The video will show your client performing activities that have been affected by his or her injury. The judge or jury can see the pain your client experiences moving about in their home, getting in and out of their car and in the simple functioning of daily life. Other video services your court reporter may be able to handle include site documentation, trial presentation support, corporate training and educational videos, etc. 2. Scheduling and Managing All of Your Out-of-Town Depositions, Court Reporters and Videographers. When out-of-town depositions need to be scheduled, how do you find a court reporter and videographer to cover them? What if you’ve never had a positive experience with a court reporter in that region? Do you just do a Google search and hope to find a good one? Ask your local court reporting firm if they can handle scheduling and managing these depositions for you. They may already have a well-established network of other reporting firms they’ve worked with in the past. Let them determine which reporter would be best, handle all of the scheduling arrangements, production of your transcript and billing. Why go through the hassle yourself? Similarly, when you’re needing to find a conference room for an out-of-town or local deposition, ask your court reporting firm. They may already have one or many they own or have access to. 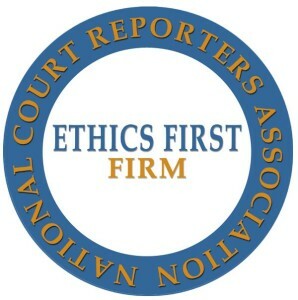 If you’re already using a court reporter, the firm may provide the conference room at no added cost. Don’t make the mistake of finding a room that you’ll have to pay normal conference room rates for before scheduling your court reporter. Communicate with your reporting firm or reporter first. When you need an interpreter for your local or international depositions and legal proceedings, ask your court reporting firm. They will often know which interpreters (foreign language or sign language) are well-qualified for your deposition and schedule the interpreter for you. If you know you’re going to be using a good number of exhibits during your deposition, let your court reporting firm know about them. If there is anything you’d like done with exhibits in preparation of the deposition, such as having copies made or scanning to display them on a screen, your court reporting firm may handle this for you. Have you been delegating these tasks to your court reporting firm? If not, you may want to start. Not all court reporting firms will or can handle all of these tasks for you. 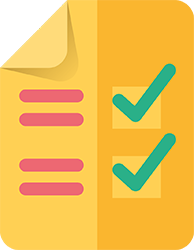 Delegate to those who can to save yourself the time and hassle of managing these administrative details of depositions so you can focus on everything else you do.